Step stools. White or natural step stools. Large or regular step stools. 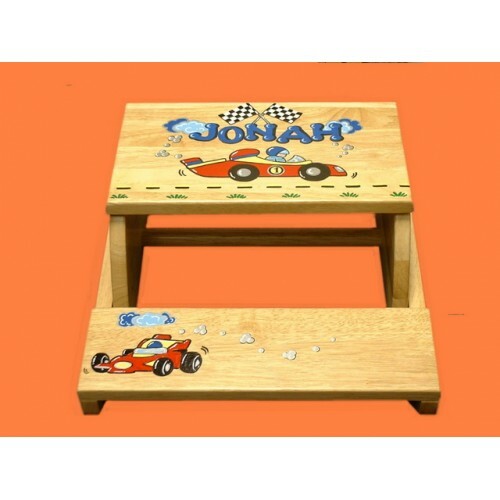 Step stools with race car design. Painted name and design. Personalization. Reg. or Large Step Stools /NATURAL or WHITE / "Race Car"
Choose from two sizes: LARGE $105 or REG. $85. 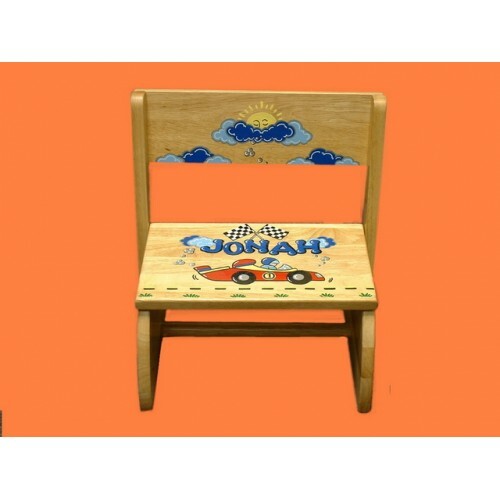 LARGE Seat Height 8.5"; Height extends to 16" H. with bar in Up position x 12" Deep x 14.5" Wide-- Or, REGULAR Size--Seat Height 6" ; Height extends to 12" High in Up position x 10" Deep x 12" Wide. Stepper bar flips up to form a seat, or down for a Step Stool! Available in White or Natural, Large or Regular Size. NAME & DESIGN INCLUDED! (This particular Design is an extra charge, price as shown).